After Hurricane Matthew tore through the state in 2016, Advanced Integrated Controls installed ELAN®, Sunfire®, Niles® and Panamax® solutions to give new life to one home’s destroyed automation system. PETALUMA, CALIFORNIA — Bluffton, South Carolina-based Advanced Integration Controls (AIC), a longtime ELAN® dealer, has won two CTA TecHome® Mark of Excellence Awards at CES 2018 for a single project that used ELAN, Sunfire, Niles and Panamax solutions to bring a home back to life after existing equipment was destroyed in Hurricane Matthew. 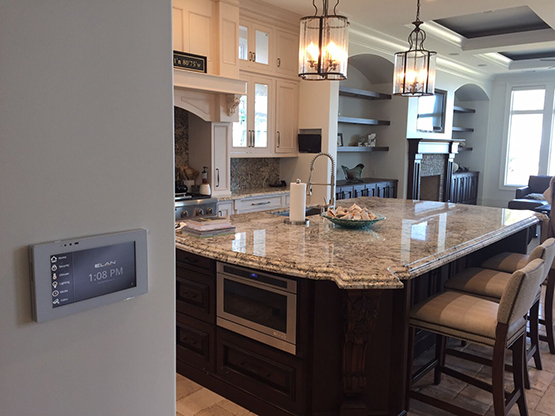 According to AIC Owner Curtis Hubner, winning awards for “Custom Home of the Year $50,000 - $150,000” and “Retrofit of the Year” highlights the major technology upgrades and hard work offered by his team and Nortek Security & Control’s latest products. The project arose after much of the owner’s existing technology was destroyed in Hurricane Matthew, including a Colorado vNet control system and most major distribution components. This meant the entire system required an evaluation and most of it needed to be replaced. ELAN’s capabilities and ease of use go far beyond what the owners were accustomed to, bringing a new level of control and comfort to the home. 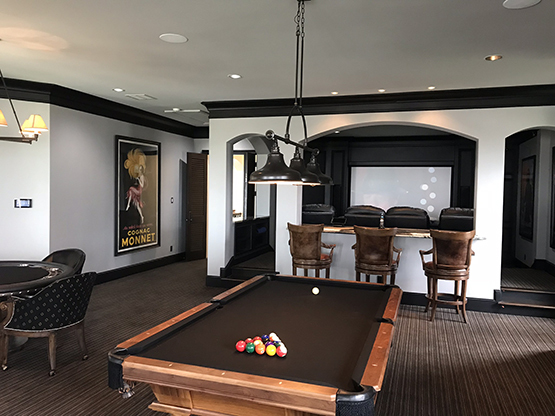 In total, the new ELAN system covers the entire 8,600 square foot home with distributed audio and video, climate controls, security, 108 lighting zones, surveillance, and pool and spa controls. Sensors send alerts for any issues related to fire or water, and the Panamax M4315-Pro with BlueBOLT remote functionality protects equipment from power surges. With ELAN, the owners now have 100 percent access to every connected system from anywhere in the world, including six Luma surveillance camera feeds and recordings, a Lutron HomeWorks QS system for lighting and HVAC control, 32-zone security system, and distributed audio and video. Some of the most noticeable upgrades came in the ELAN user interface itself, which is identical on every device from the four in-wall ELAN TP7 touchscreens to the owner’s mobile devices and computers. Two ELAN HR200 wand-style remotes afford instant access to TV and music with a familiar feel and responsiveness, while the touchscreens and mobile devices offer total control over nearly every part of the home. The client can even use Amazon Alexa to control the ELAN system by voice command. While the client’s beloved home theater wasn’t damaged in the storm, it too saw an upgrade with the addition of a new Sony True 4K projector and a Sunfire HRS subwoofer. Niles CM7HD and CM7SI speakers bring audio to multiple rooms, while two ELAN S1616A Multi-Zone Amplifier/Controllers deliver crystal clear sound throughout the home. ELAN integrates every aspect of the home – a ring at the door mutes all music within the home and prompts the owner to speak to the visitor through the ELAN intercom system, which can be accessed from any ELAN interface. 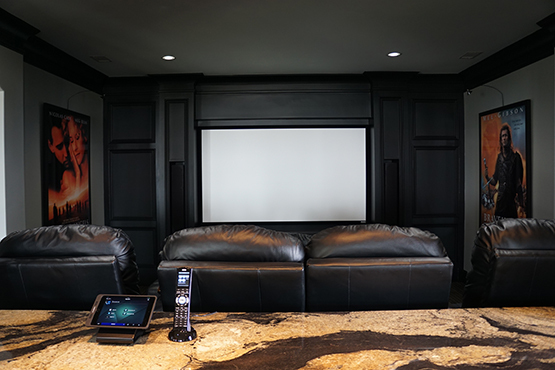 An ELAN gSC10 Controller drives the majority of the home control and automation experience, while an additional ELAN gSC2 Controller controls the family room and rear porch. An advanced WiFi network using Netgear Nighthawk routers ensures consistent WiFi coverage across all 8,600 square feet of the home. Special programming was added to comply with local sea turtle regulations, which state that beachfront properties cannot light the beach after dark. AIC added schedules to ensure this home complies with the regulations and protects the fragile sea turtle nesting habitat. The TechHome® Mark of Excellence Awards, presented by the Consumer Technology Association (CTA)™, recognize the best in custom integration and installed technology. Each year manufacturers, distributors and systems integrators compete in more than 30 award categories for this coveted honor. ELAN develops an award-winning line of whole-house entertainment and control solutions distributed through a comprehensive channel of select dealers throughout the United States, Canada, and countries worldwide. The ELAN 8 update was honored with the “2017 Human Interface Product of the Year” award and continues to expand its intuitive functionality. To learn more, visit www.elanhomesystems.com. Nortek Security & Control LLC (NSC) is a global leader in smart connected devices and systems for residential, security, access control, AV distribution and digital health markets. NSC has deployed more than 4 million connected systems and over 20 million security and home control sensors and peripherals. Through its family of brands including 2GIG®, ELAN®, GoControl®, Linear®, Mighty Mule® and Numera®, NSC designs solutions for national telecoms, big box retailers, OEM partners, service providers, security dealers, technology integrators and consumers.